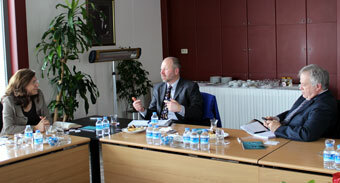 Andrew R. Smith, Consul General of Canada in Istanbul, and Rene Wassill, Trade Commissioner, visited Istanbul Chamber of Industry. The Canadian diplomats were received by Melek Us, ICI Secretary General, to discuss potential areas of cooperation between the two countries. Melek Us stressed the impact of visas on the efforts to enhance cooperation, and the ICI members’ call for simpler visa procedures and longer visa durations was met by the Canadian representatives stating their intention to address these issues in a coordinated effort with the ICI. On the other hand, representatives from Consulate General of Canada expressed their interest in developing channels for economic cooperation with industrialists in Istanbul. Highlighting Canada’s substantial experience and expertise, particularly in energy and aviation, Andrew R. Smith expressed their willingness to cooperate with industrialists in Istanbul interested in moving into these sectors. Another outcome of the meeting was consensus on the need to improve vocational education, and develop joint projects within the scope of the Enterprise Europe Network, which lists Canada among its members.